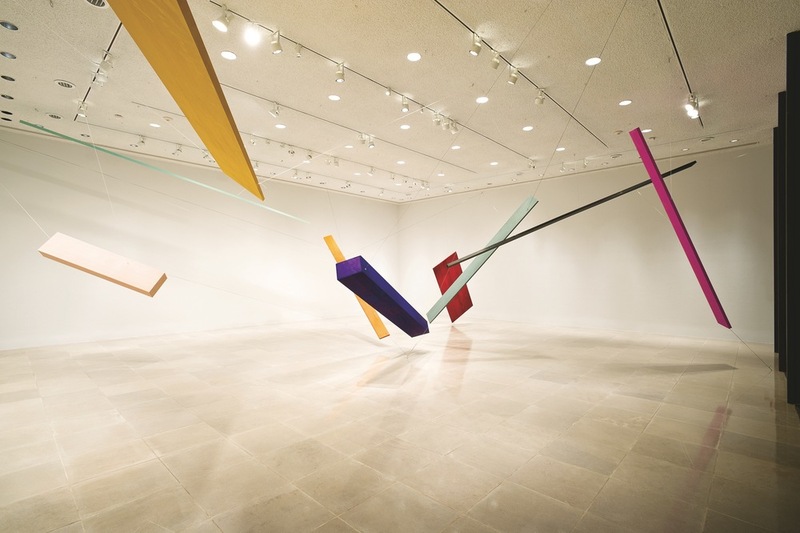 Joel Shapiro’s new installation at Rice Gallery is a gravity-defying array of color, form, shape, and line. 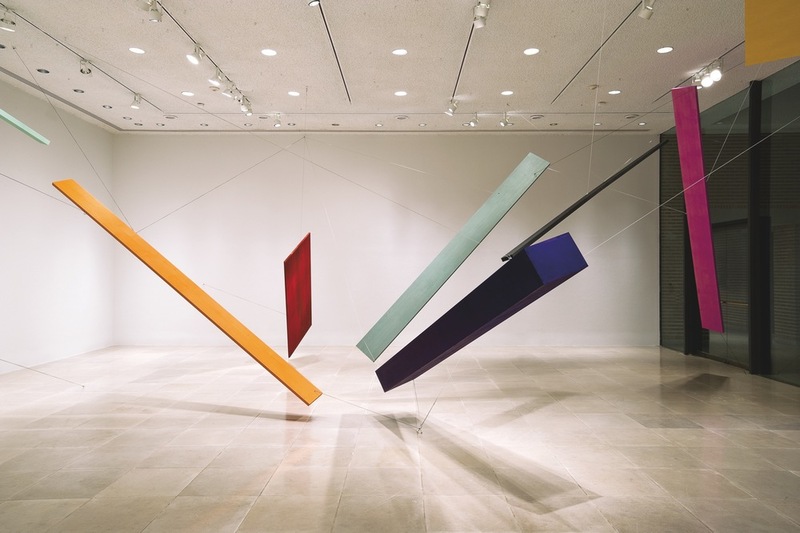 Wooden elements, vibrantly painted with supersaturated pigment and casein, seemingly levitate in the air as they are held in tension by string stretching from the center of the gallery’s floor to points on the ceiling. The individual elements are physically tied to the surrounding architecture, yet seem completely free from it as they float and twist in a state of suspended animation. 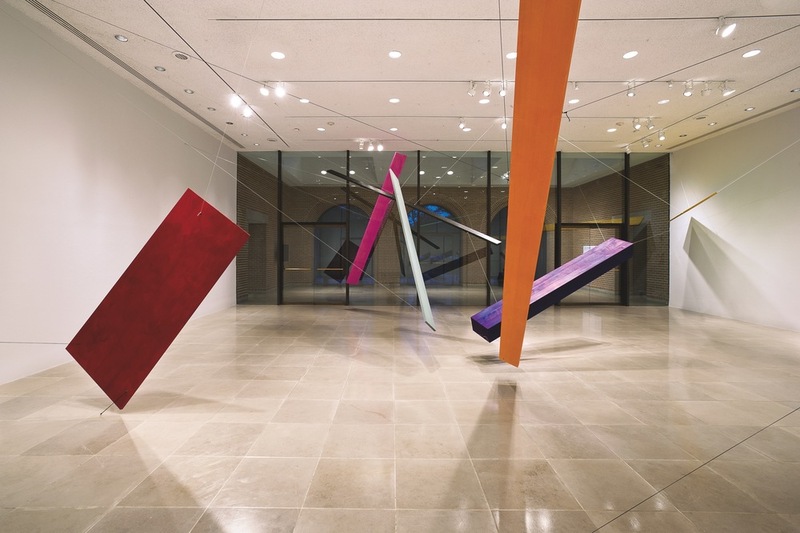 The configuration is at once formally rigorous and utterly spontaneous, as color and form appear to simultaneously implode and explode from the center of the gallery space. 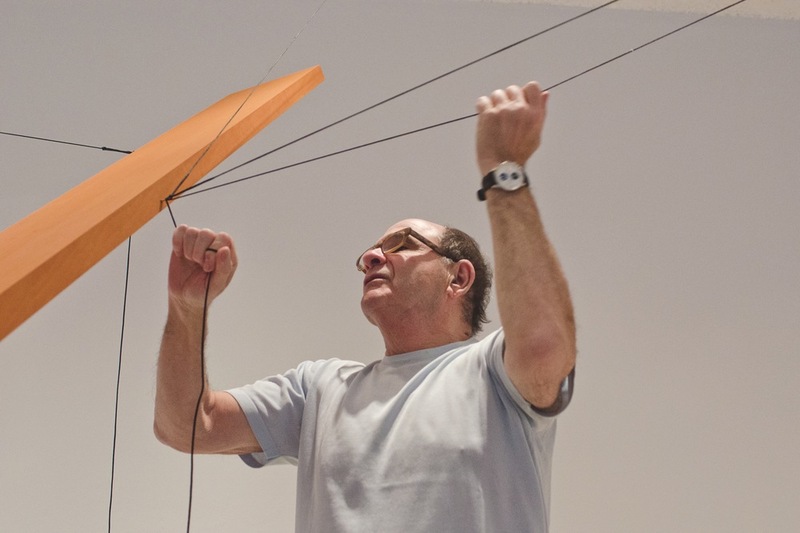 A celebrated artist who has been making work since the late 1960s, Joel Shapiro is well known for his geometric, abstract sculptures that appear to bound across museum walls, floors, and sculpture gardens. In these sculptures that often allude to the human figure, Shapiro recombines simple forms to play with the internal and external relationships that define a sculpture. He looks at how the individual parts relate to one another, and how the sculpture as a whole relates to its surroundings (floor, ceiling, and viewer). Using dynamic ways of joining wood, bronze, or metal, Shapiro creates work with a vitality and energy that is completely new and fresh, and at the same time, addresses fundamental formal concerns that cross centuries of art making. Shapiro notes that one of the basic questions that has driven him as a sculptor is, “How do you animate material so inanimate, so obdurate?” For an exhibition in 2005 at the Musée dOrsay in Paris, France, Shapiro choose to enlarge an existing small-scale sculpture because of what he saw as a remarkable correspondence it had to the formal elements of Jean-Baptiste Carpeaux’s Dance (1865-1869). His resulting work, 20 Elements, was a tumbling, riotous arrangement of rectangular shapes in bold primary colors. It echoed, and yet departed from Carpeaux’s work, as they both engaged in the same struggle to create movement out of inert material, in Shapiro’s case, wood, and Carpeaux’s, stone. To work out these complex relationships, Shapiro made a scale model of Rice Gallery to become familiar with the space. He worked within this model and then on an actual scale mock-up in New York studio. As he worked back and forth between the model and the mock-up, he sensed the beginning of an installation seemingly about the dispersal of a human figure, “not ripped apart, but animate, expanding.” As he altered it, the mock-up kept “sinking down in the studio, getting lower and lower, and looked better and better because it had a greater sense of gravity.” He slowly added pieces, fabricated the final wooden parts, and adapted the model to use as a guide to work from at Rice Gallery. Over the course of a week as he worked on site, Shapiro did not rigidly follow the model, but assessed the work in the gallery space to find a final composition. In the final installation, the elements are loosely organized around a weighty, diagonal block of deep blue. 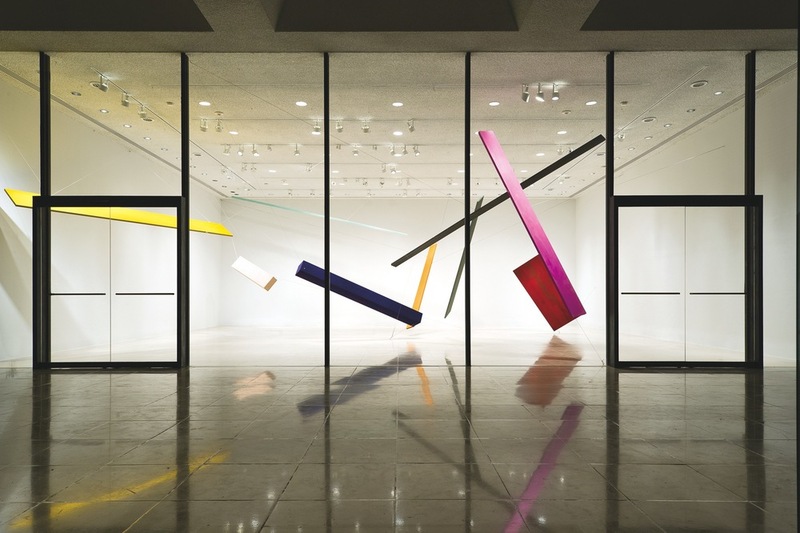 It is the first time Shapiro has suspended a volumetric form in one of his installations, as opposed to using only the flat boards. Shapiro explains, “I wanted it to levitate. I wanted it lower to the ground, so you had a sense of its gravity. That was the principal organizing element, and then dispersed from that point on.” This beam is painted “Paris Blue,” a pigment mixed with casein that shifts from a deep blue to purple as it absorbs light differently. Shapiro describes his use of color as “naturalistic.” As he attempted to find the right synthesis of color and shape, he tried to avoid using color that looked too “canned” or decorative. A skinny line is painted “Lamp Black,” a large rectangle an “Urbino Red,” and a long plank a “Cobalt Violet,” to name a few. There is no perfect arrangement. That’s part of the game. You can be creative and invent something. You could take those elements, reconfigure them, and perhaps be more exciting or less exciting. It’s just a moment in time.